Why not add some live music to a business evening or to a club, charity or social event? Our charges vary depending on how long you would like us to sing for. Charity events can be a minimal amount to cover our expenses. We can tailor our show to your needs. Our repertoire covers a range of styles and eras, from Bing Crosby to Boyzone! 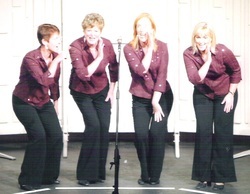 We can even involve the audience with some singing! Contact us if you want any information.